Remove the registry key GracePeriod and reboot the computer. Until IIS 7.5, the major limitation of IIS is that IIS will allow you to bind only one site for one IP: Port combination using an SSL certificate. If you try to bind a second site on the IP address to the same certificate, IIS will give you an error when starting the site up stating that there is a conflict. In order to assign a certificate to be used by multiple IIS sites on the same IP address and port, we need to use a special mechanism. Before we go there let’s understand why it is not possible for IIS to allow the binding of multiple sites on same IP: Port combination using an SSL certificate. You can have multiple HTTP site configured with different combination of above. The binding, for example 192.168.1.0:80 can be configured to site “MyServer1.com”. That means if I browse to IP-address 192.168.1.0 over port 80 then I will hit the site “MyServer1.com”. I can have the binding as 192.168.1.0:80:myserver2.com configured for site “MyServer2.com”. That means when I browse the site over IP-address 192.168.1.0 over port 80 with a host header as “myserver2.com” then I will hit the site MyServer2.com. This allows multiple DNS hostnames on a single server at the same IP address. However this doesn’t work in HTTPS. To know why it doesn’t work in HTTPS lets understand the SSL handshake briefly. Now let’s say hypothetically, you have set two sites on same IP-address and port and different host headers and you set two different certificates on both of them. Look at the steps in SSL Handshake, Client sends the HTTP Request only in Step 4. That means Server doesn’t know what host header HTTP request is referring to until step 4. So at Step 2, Server has only IP-Address and Port information with it, so how can server figure out which certificate it needs to send to the Client as you have bind two certificates to same IP-Address and port. When a request comes to HTTP.SYS layer, the HTTP.SYS reads the site configuration, including the certificate used to encrypt/decrypt the data. The host name is encrypted in SSL Blob that the client sends. However, IIS needs to know the host name in order to get the right certificate. Without the host name IIS cannot get to the correct site. As IIS is not able to get to the correct site so it cannot get the right certificate to decrypt the SSL blob to get the host name. This is the classic Chicken and Egg problem. We are turning into circles with no way out. This is the precise reason; HTTP server can only allow one site per IP-Address: Port combination for HTTPS browsing. If you need to bind another site over HTTPS then you need to get either a different IP-Address or bind the site to a different port. Sometimes getting a new IP-Address or port for each website becomes costly affair. So how we can attach two website to HTTPS over same IP: Port. There are two ways to do it in IIS7. A wildcard certificate can secure an unlimited number of first level sub domains on a single domain name. For example, you can get a certificate which is issued to *.mydomain.com. This certificate will secure www.mydomain.com, secure.mydomain.com, welcome.mydomain.com etc. Basically it will work on any subdomain that replaces the wildcard character (*). Step 1: Install the wildcard certificate. Verify if the certificate is properly installed. 5. Select Computer Account when prompt for which certificates the snap-in will manager. 10. You should see the * in the friendly name. You need to select the certificate for all the three sites which are configured for same IP-Address and port. After you installed the Certificate on all the websites with same IP address and port and you try to browse the sites. You will see that all of the HTTPS responses come from one specific site. That means if you try to access https://test1.myserver.com, https://test2.myserver.com or https://test3.myserver.com you will get the response from one site only. You won’t get the corresponding pages from different Websites depending upon the site in URL. Why? Because of the chicken and Egg problem remember. When the request comes to HTTP.SYS layer then Schannel will be able to decrypt the request but after decrypting the request it doesn’t know which site it needs to send the request as all the sites listening to same IP-Address and port. To resolve this issue we need to add host headers to the sites. Go to Start Menu, click Run, type “cmd”, and then click OK.
You can also change this by changing the metabase.xml for that particular site. Add the hostname in the SecureBindings explicitly for each site. In IIS7, attaching a wild card certificate is much easier. You can attach the certificate to the website you need to attach to. The moment you select the wildcard certificate the hostname field in the UI will be enabled. You can type the host header in it. You can do the same procedure for multiple sites. We have multiple sites on same IP: Port with the same certificate (wildcard certificate) attached to them. When the request reach to HTTP.SYS layer, the Schannel gets the IP: Port information from the request. Since there is only one certificate attached to that IP: Port Schannel use that wildcard certificate and decrypt the request using the private key. After decrypting the request, HTTP.SYS is able to get the host header information. Using the host header, HTTP.SYS can put the request into the proper request queue. Limitation of Wild Card Certificate. There are certain limitations of wild card certificate. 1) It can only be applicable to single level of subdomain. For example you got a wild cart certificate for *.mydomain.com then you can bind this certificate to sites such as site1.mydomain.com or site2.mydomain.com. However, you cannot bind the wildcard certificate to Site1.myexample.mydomain.com or Site1.example2.mydomain.com or xyz.abc.mydomain.com etc. That means the wild cart certificate will work only till first level of subdomain. 2) The wild card certificate will work only if the site has same domain name. That means if you have certificate for *.mydomain.com then you cannot bind this certificate to sites such as www.example.com or www.mydomain2.com etc. Wild card certificate will work only for sites which have same domain name. 3) You can set the wildcard certificate only for one top level domain. For example you can bind a wild card certificate forwww.test1.myserver.com or www.test2.myserver.com, but you cannot bind the same certificate for hostheader www.test2.myserver.org orwww.test2.myserver.net etc. You can setup the wildcard certificate if the domain name for all the sites are same and first level subdomain changes. What if you want to set up the sites which should work on two different domain names, for example, a site with host header as www.testserver1.com and another site with hostheader as www.testserver2.com. In this case Wildcard certificate won’t help you. To resolve this issue we have SAN Certificate. A SAN cert allows for multiple domain names to be protected with a single certificate. For example, you could get a certificate for myserver.com, and then add more SAN values to have the same certificate protect myserver.org, myserver.net and even myserver2.com orwww.example.com. You need to select the SAN certificate for all the three sites which are configured for same IP-Address and port. Note: The hostheaders which are defined in the Subject Alternative Name, only to those hostheaders you can bind the site. That means if you set the Subject Alternative Name to www.test.edu, http://www.test.com, http://www.test.testing.com then you cannot bind this certificate to a site with hostheader say http://www.example.com. That means if you try to access https:// http://www.test.edu, https://www.test.com or https://www.test.testing.com you will get the response from one site only. To configure the SAN certificate you need to run the below command after changing the website name, ip-address and port and the host header value. We have multiple sites on same IP: Port with the same certificate (SAN certificate) attached to them. When the request reach to HTTP.SYS layer, the Schannel gets the IP: Port information from the request. Since there is only one certificate attached to that IP: Port Schannel use that SAN certificate and decrypt the request using the private key. After decrypting the request, HTTP.SYS is able to get the host header information. Using the host header, HTTP.SYS can put the request into the proper request queue. There are certain limitations of SAN certificate. 1) One major limitation of SAN certificate is if you have issued the SAN certificate for say two host-headers http://www.test1.com andwww.test2.edu but you need to setup a site for www.test3.net using the same certificate then you can’t use it. You need to get another SAN certificate from the CA with all the three host-headers. In short, for every addition of a host-header you need to get another SAN certificate. 2) There are certain limitations which are defined by the CA on the number of host-header you can add to the Certificate. That means, after a certain number of host-header you cannot add further host-header into it. a) Connect to the VMware ESXi 5 server using the vShpere Client. 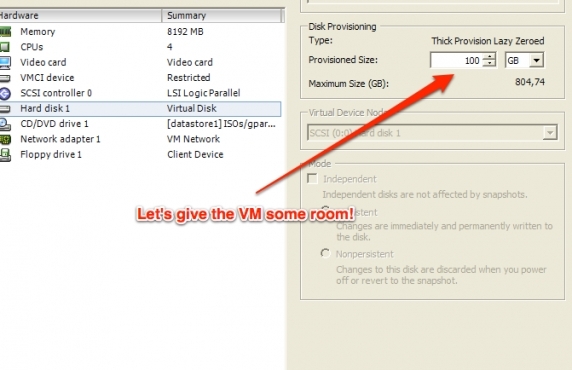 Edit the VM’s properties to increase the hard disk size (VM has to be off) – I won’t get into details on that, if you have the experience on managing ESXi you know what to do… I’m assuming the process is the same for ESXi 4. Now restart the VM. b) Login via SSH to the VM and follow this process. – Now let’s extend the server’s Volume Group to that physical volume. This will give you the info on your current Volume Group. Note down the entry next to “VG Name”. That’s your Volume Group name. and note down the entry next to “LV Name”. This is your logical volume’s name (e.g. /dev/srv/root), which you’ll now extend to the newly added partition/physical volume. (this may take some time depending on number of GBs added to the file system. You should now see an increased disk space for your primary logical volume. Go to Virtual Machine > Install VMware Tools (or VM > Install VMware Tools).Note: If you are running the light version of Fusion, or a version of Workstation without VMware Tools, or VMware Player, you are prompted to download the Tools before they can be installed. Click Download Now to begin the download. When prompted for a password, enter your Ubuntu admin user password. Note: For security reasons, the typed password is not displayed. You do not need to enter your password again for the next five minutes. Note: x.x.x-xxxx is the version discovered in the previous step. Note: The -d switch assumes that you want to accept the defaults. If you do not use -d, press Return to accept each default or supply your own answers.